Home Kollywood News Arya & Sayesha Saigal announce their marriage! There was a speculation doing rounds in the past few weeks that actor Arya and actress Sayesha Saigal are in love. The reports also suggested that the couple are getting married in the month of March 2019 at Hyderabad. But, the duo neither confirmed or denied the news. 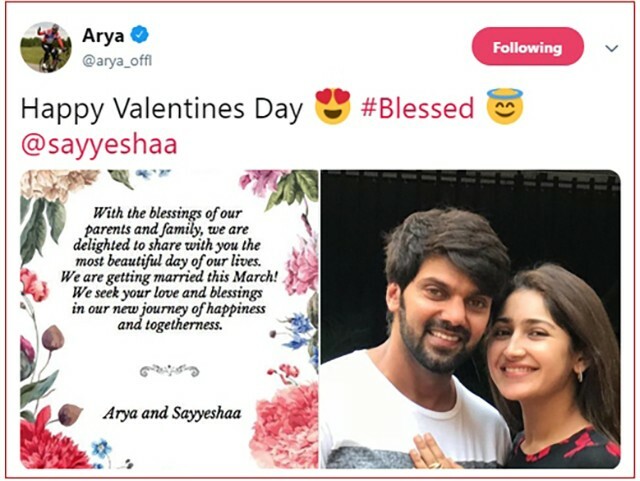 But today, on the occasion of Valentine’s day Arya and Sayesha Saigal took to twitter to make an official announcement about their marriage. Arya and Sayesha Saigal posted a formal announcement of the wedding alongside a photo of the glowing couple. The tweet says “With the blessings of our parents and family, we are delighted to share with you the most beautiful day of our lives. We are getting married this March! We seek your love and blessings in our new journey of happiness and togetherness. – Arya and Sayyeshaa,”. According to the source, Arya and Sayesha Saigal’s marriage will take place on 9th March 2019 according to Muslim traditions in Hyderabad. The duo acted together in the romantic comedy flick ‘Ghajinikanth’ in 2018 and then fell in love with each other. They are set to act together again in Suriya starrer ‘Kaappaan’, which is directed by famous movie maker KV Anand. Heartfelt wishes for Arya and Sayesha Saigal from Kollywood Zone!